The cardio barre workout will get your heart rate up and burn serious calories. You can do this workout at home or at the gym! All you need is your own bodyweight and a timer. Hey friends! How are you? I hope you’re having a great morning so far. Today, I’m doing a couple of fitness consultation calls (wahoo! ), putting the finishing touches on tomorrow’s podcast episode, and catching a strength workout at the gym. Lately, I’ve been focused on adding strength variety to my routine: heavy lower rep work at Telos, moderate rep and intensity at Orangetheory, and low weight, higher rep endurance work through BODYPUMP, Peloton, and Barre. I found that I get the most benefits from my efforts when I include a mix of traditional hypertrophy work and endurance work. My muscles look and feel different, and it always keeps me challenged! (You can read more about the difference between traditional strength and endurance here.) As you guys know, I’m a huge fan of barre, but one of the top complains I hear about barre is that it doesn’t include very much cardio. Participants often like to go to classes for a calorie burn, and with barre, it can be fairly low. (The good news is that when you take a class, you FEEL it working, so it must be magical even though my Apple Watch doesn’t give it enough credit.) Many barre classes and studios have incorporated more variety in their classes, whether it’s through core and cardio-focused classes, or fusion classes that include spin bikes or Pilates reformers. I like it all. If you’re looking for a barre workout that will get your heart rate up, I got you, boo. This one includes some of my very favorite heart-pumping barre intervals. You can also keep the moves low impact by eliminating any of the jumps. You’ll still get an awesome workout! Marches: March in place, using your core to lift your legs and exhaling as each leg rises. Pull your arms down with each march, engaging your lats. The goal is to get your legs as high as your hip bones, as straight as possible, and toes pointed. Low plie squat pulse: For this squat variation, you’ll take a SUPER wide stance and turn your toes out. As you sink down, keep your chest lifted and endeavor to get your thighs parallel to the floor. Make sure your knees extend towards your toes but not past your toes. Hold your squat here, with arms extended out to the sides, and pulse up two inches and down two inches the entire time. Plie squat burpees: Sit into your plie squat and bring both hands to the floor, firmly planting your entire hand. Walk or hop back to a plank position (push-up here optional), walk or hop your feet back to your hands, and jump vertically, raising your arms overhead. 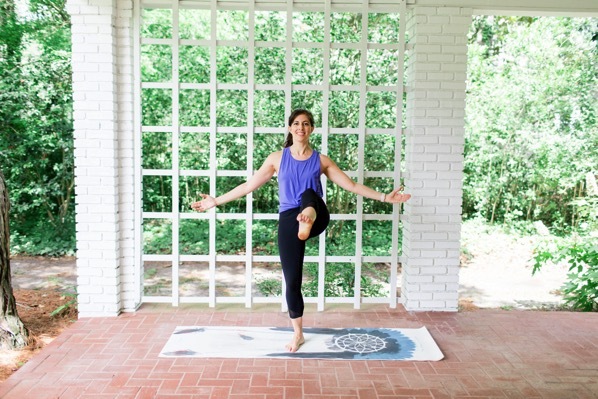 Touch the floor and passé: Stand with legs hip-width apart, bend at the hips to touch the floor as one leg lifts up behind you. Return to standing, bending the knee and driving it forward. Repeat all reps on one side before switching. Plie squat jumps: Get into a plie squat position (feet wide and booty LOW), and touch the floor. Keep your abs engaged and chest lifted. Powering through your heels, spring up, reaching your arms towards the ceiling. Land with a soft knee. Repeat. Side lunge to passé: Try to keep your chest lifted and core tight as you perform the exercise. Aim for some dynamics and height change with your movements, as this will make the exercise even more challenging. As you rise from the side lunge, bring that leg to a bend position with arms in front. Spring up from your bottom leg and land softly. The post Cardio Barre Workout appeared first on The Fitnessista.